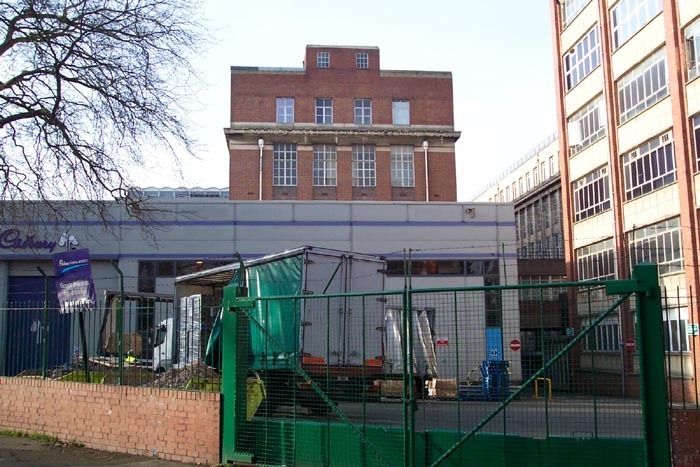 Construction began on the Cadbury chocolate factory at Bournville in 1879 at a time when the business had outgrown its premises in Bridge Street in Birmingham City Centre and George and Richard Cadbury had identified a greenfield site in south Birmingham as a prime site for development. 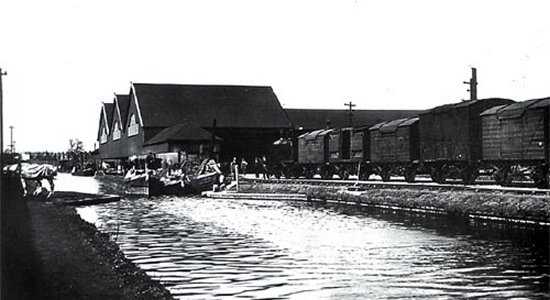 Initially, the factory exported/imported produce/supplies by means of horse and cart that conveyed the goods across the factory and along Bournville Lane up to a small canal wharf or along Pershore Road to the railway goods facilities at Lifford. 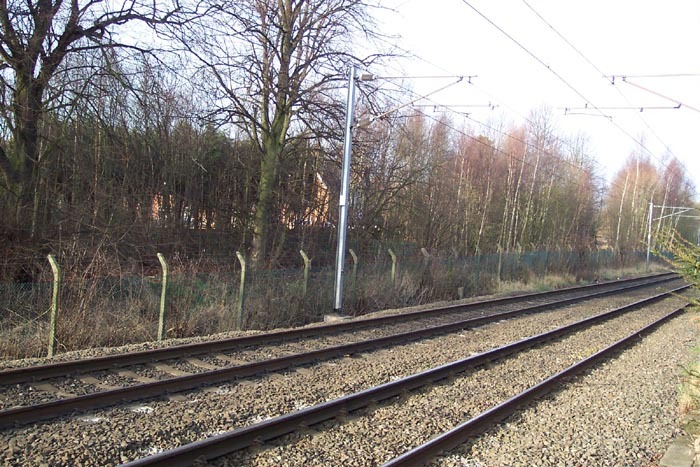 However, with the factory expanding rapidly, a scheme of greater capacity was required and a single line was built from the factory to an exchange siding along the Midland line opening in 1884 and operated by a single locomotive. Continuing expansion led to a corresponding expansion in the railway system at the factory. Six miles of standard gauge track were eventually built and in 1925 a direct link between the factory and its Waterside Wharf (seen at the top of the page) was completed by way of a bridge spanning both the Midland's Birmingham West Suburban line and the Worcester - Birmingham canal just north of Bournville station (Stirchley Street station being renamed Bournville in 1904 after several combinations of the two names). Above-left we are standing on Bournville Lane looking at the site of the engine shed. During the course of the railway's time in operation at the factory, 15 locos were owned by Cadbury's (numbers 11 - 14 being diesel shunters, the first of which being delivered in 1958), with the first loco being unnumbered and simply named 'Cadbury'. 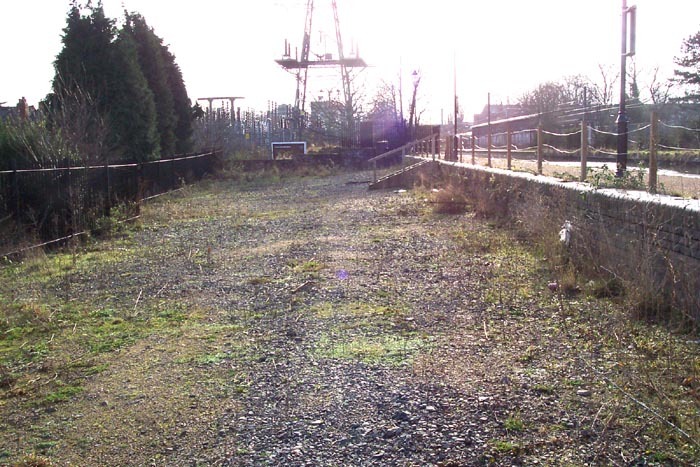 Above-right we have the shed to our left and are looking along the 'trackbed' towards (but distantly out of shot) the point where it inclines and crosses the railway immediately to the right and canal beyond it to loop back on itself and serve the wharf facilities. In the shot above-left the railway ran from left-to right along where the truck trailers are parked in the foreground. 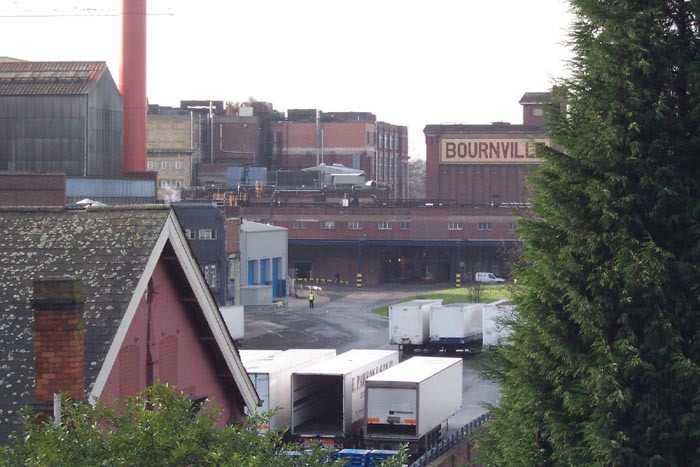 Additionally, immediately to the right of the building carrying the 'Bournville' moniker came a double-track from the other side of the factory that linked with the aforementioned line to head-off to the right on its way to its sidings with the Midland main line and Waterside Wharf. Above-right again we have the track approaching from left to right and track approaching between the group of white truck trailers and the car park to its right. Both photographs were taken from the towpath of the Worcester - Birmingham canal with the wharf to our rear and the Midland line in between ourselves and the factory: Cadbury's are notorious for being heavily anti-photography due to a strong concern regarding industrial espionage so zoomed shots from the canal are as good as it gets unfortunately! Above-left beyond the Midland line we would have seen the tracks of the factory running alongside beginning its incline to meet the Midland line and beyond it to take a the steep curved gradient to gain sufficient height to cross the Midland line a short distance away. Interestingly, to the immediate right of the cabling gantry in this shot you can make-out a trackside 'telegraph pole' - one of the few remaining signs of the railway not now removed. 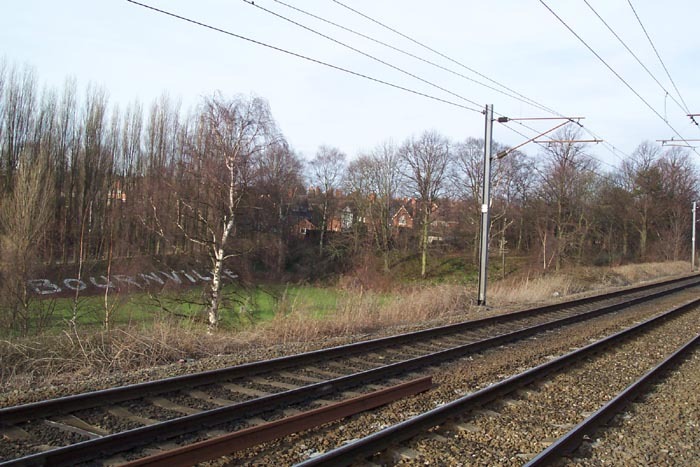 Above-right we see the site of the sidings and connection with the Midland line. 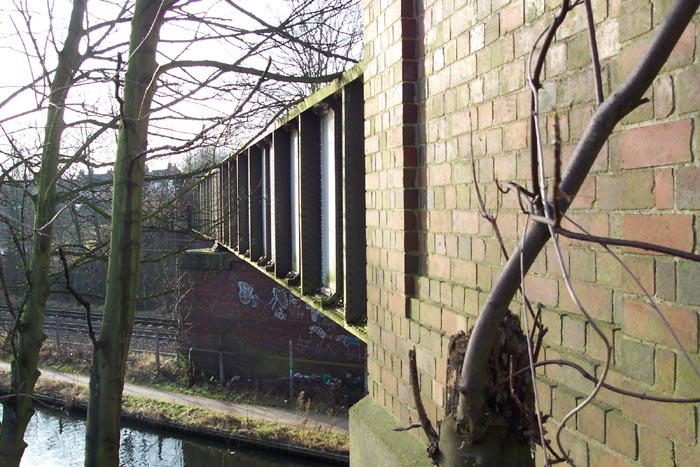 Above-left is the most significant and impressive (and sadly only remaining) structure dating from the railway - the large-span bridge over the Midland line and Worcester - Birmingham canal (and beyond it you can just make-out the bridge carrying Raddlebarn Road). 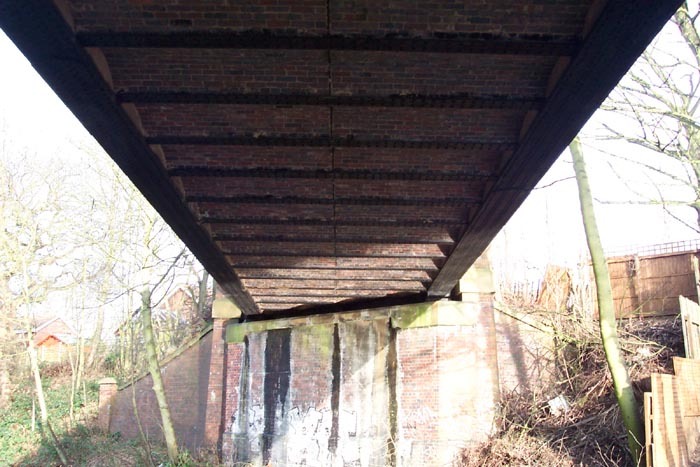 Above-right we are directly under the bridge as I thought the structure of the bridge bed was of significant interest being constructed of brick arches running cross-ways to the iron-framed structure. The bridge appear in remarkably good condition and I assume it will be standing for many years to come as it is not in dangerous disrepair and would cost a small fortune to remove requiring the closure of the Cross-City line and the enormous disruption to not only local, but national, traffic this would cause: the canal too would need to be closed for such and undertaking. 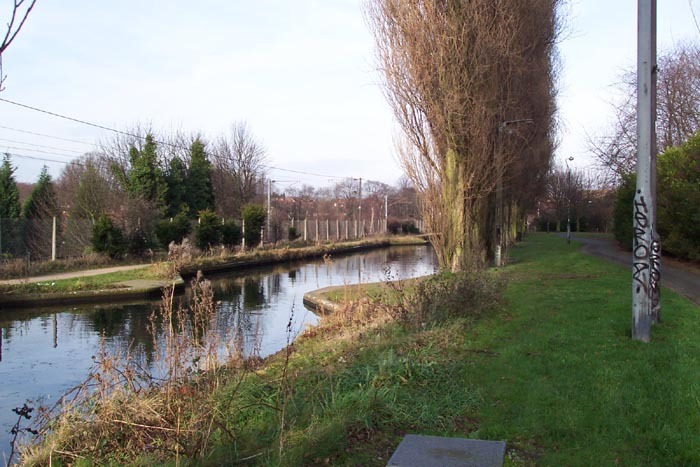 The view we see is from the canal towpath looking to the point the bridge reached the bank of the wharf. Above-left we are again looking at the connecting bridge between the two Cadbury sites but this time we are looking back towards Bournville with the wharf site on the left bank beyond the bridge itself. 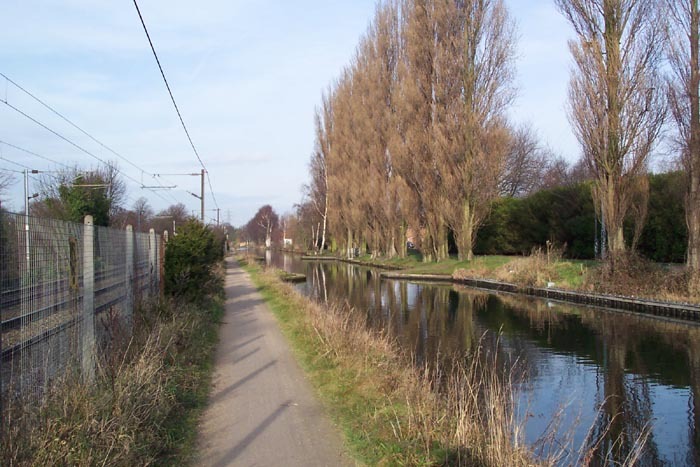 We will now leave the railway here and walk back along the towpath to make our way to Bournville Lane once more. 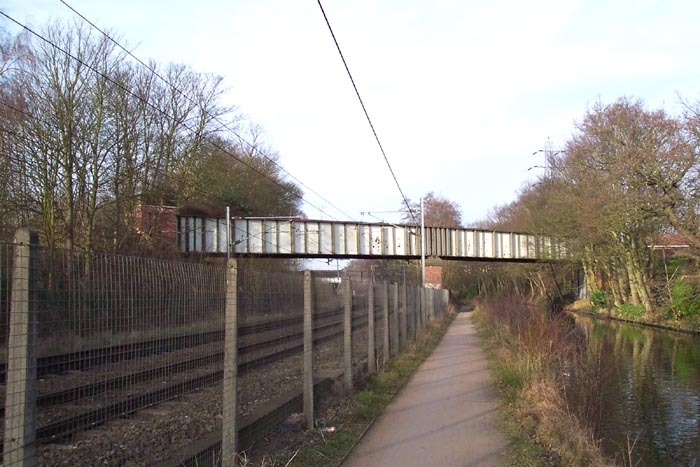 Above-right we are on Bournville Lane with the engine shed site visible through the bridge ahead. 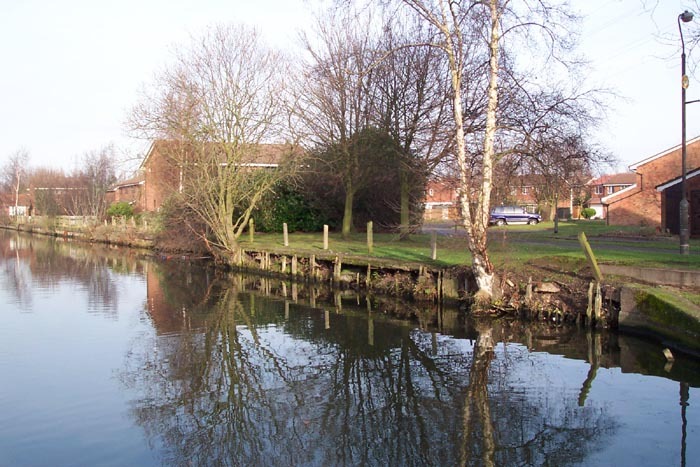 For our purposes, the interesting sight here is to the right: this is the road entrance to Waterside Wharf - the bridge ahead carrying the canal nearest camera and the railway. 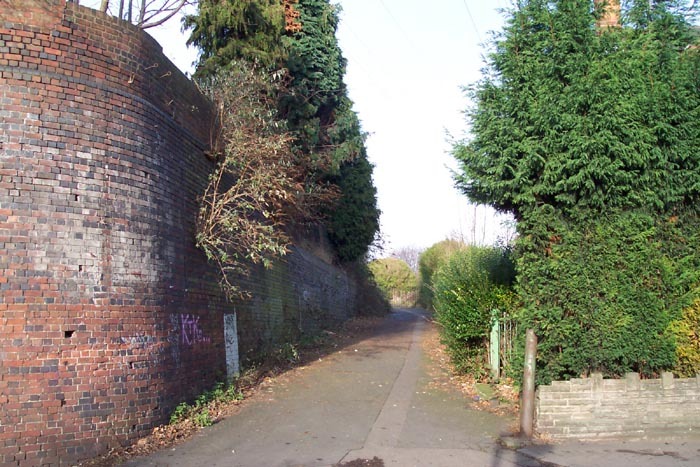 Above-left we have crossed Bournville Lane and are looking up the driveway to the wharf: note old railings and gatepost to the right. 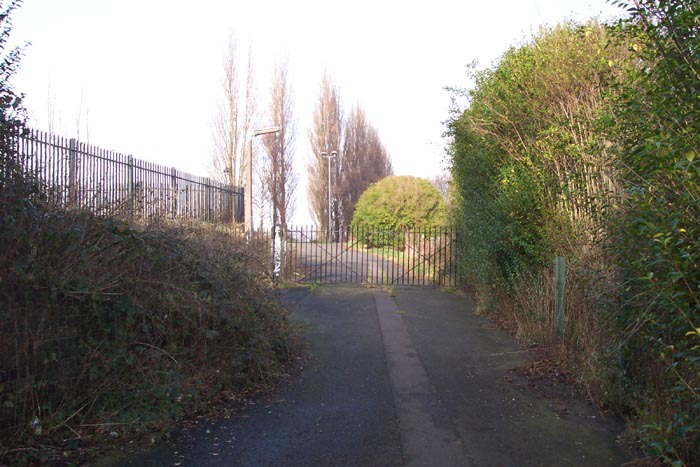 Above-right we are nearing the top of the entrance driveway where the gates are now permanently closed to road traffic as the site itself has now been developed as a residential estate with access gained for vehicles from Raddlebarn Road. Above-left we finally reach the entrance driveway summit. 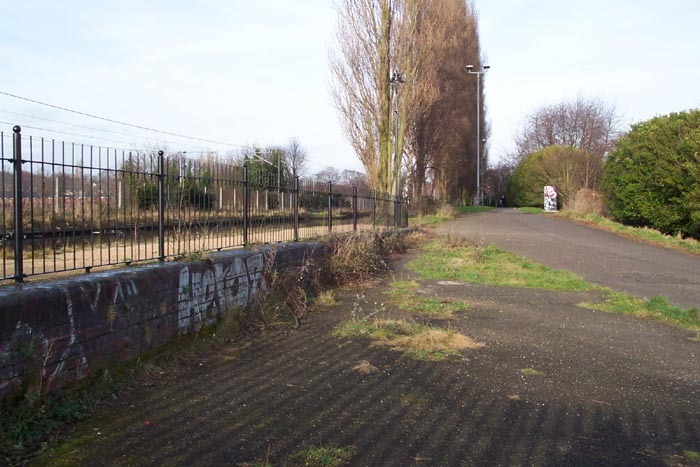 To the left is the only remaining structure from the days of the wharf: walling that, if my map reading skills are correct, formed the loading platform for the furthest south reaching branch of the wharfside railway. 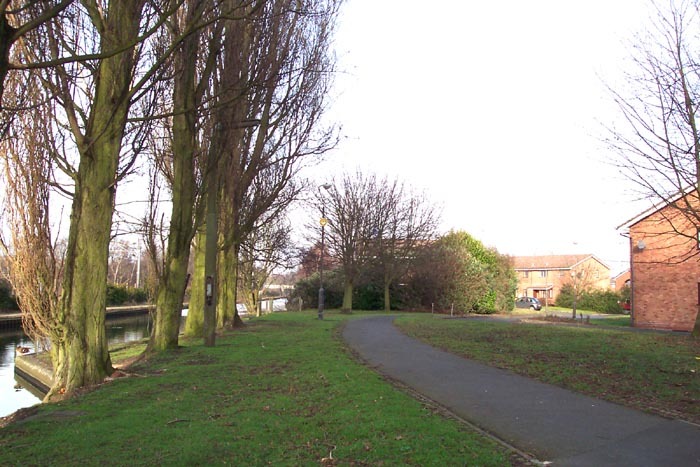 Above-right we have turned 180 degrees to see the loading area which now forms a secure area as 'Bournville Moorings' for private pleasure boat leasings. 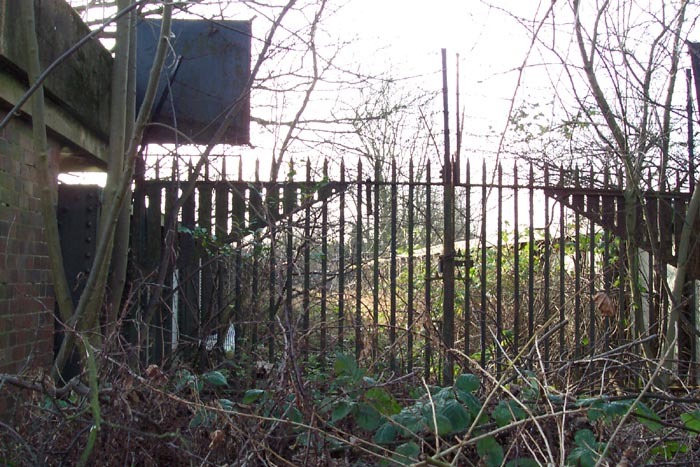 The shot was taken through the railings of the gate that locks-off this area of the site. 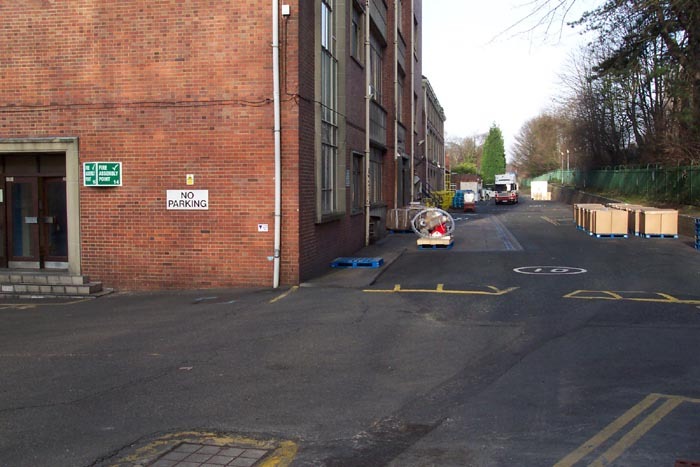 Above-we take a look back down the driveway to Bournville Lane with the wharf site facilities to our rear. It's hard to imagine the frenetic industrial activity that must have filled this site during its operational years. 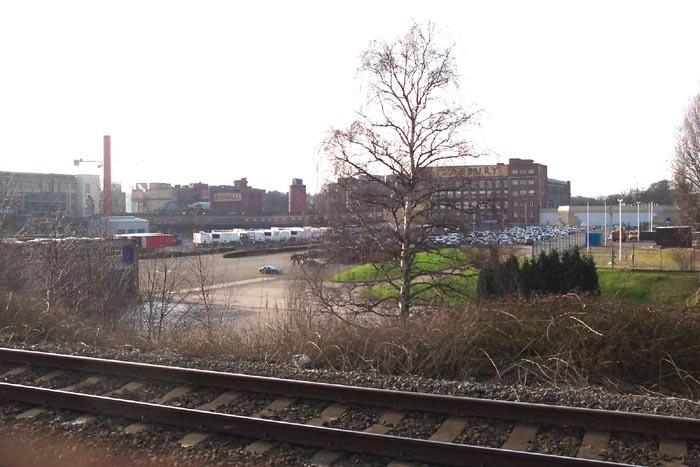 Above-left we have the entrance driveway to our rear and are looking along the trackbed into the wharf warehouse with a myriad of warehousing facilities and a further branch of the railway to our right. The sanitised housing estate has completely obliterated all trace of these elements with Leyfield Close now occupying the foreground. I recall well the site of the derelict facilities in 1978 when I regularly traveled the newly opened Cross City service and was fascinated by such a large, oppressive-looking facility. The facility itself lost its rail traffic from 28/05/76 with the closure of the wharf warehousing shortly after this date. As with other sites covered in Rail Around Birmingham, if only I'd had a camera then! 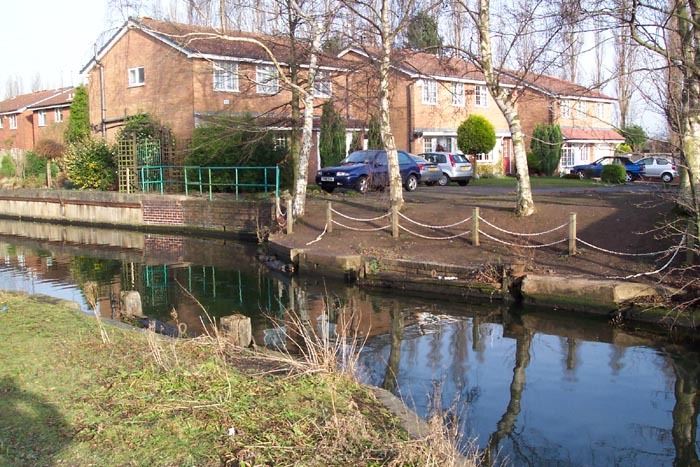 Above-right we are roughly parallel to the above-left photograph but this time on the canal towpath with Leyfield Close to our right. The bay area marked in the canal ahead and to the right mark the wharf site proper. Above-left we take a closer look at the 'loading bay' on the canal side: if my memory serves me correctly, the small pier immediately nearest to the photographer housed a pedestrian drawbridge linking wharf with towpath that consisted of a wide 'plank' and winch: no trace remains! 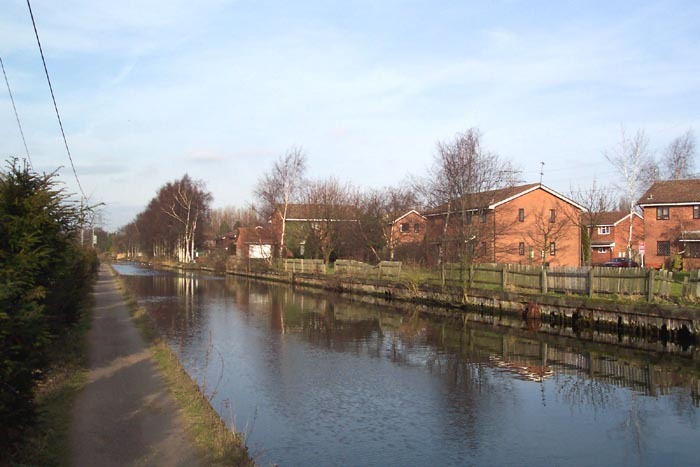 Above-right we are wharfside, standing on the trackbed of the railway, looking to the same area of canal with the transshipment warehouse seen on the first page of this section lying immediately ahead. 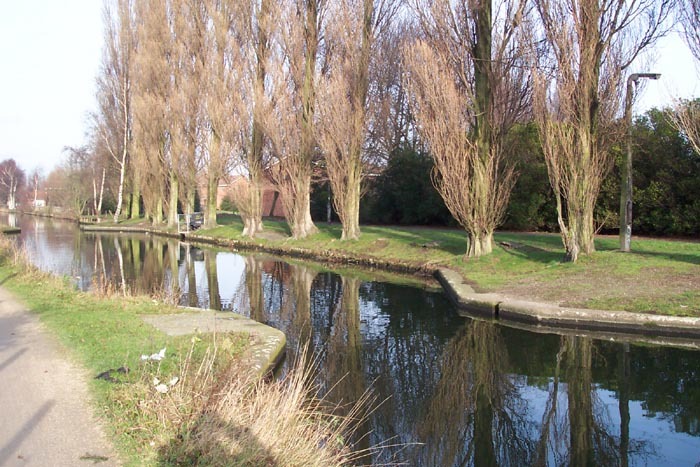 Above-left, if you imagine standing where the horse is standing on the towpath in the old photograph and looking in the same direction, this is the view you would get today. The crumbling embankment reinforcements mark the front of the transshipment area. Above-right we have walked ahead just out of shot from the previous photograph and can see the rotting remains of a pair of lock gates: unfortunately, I could not work-out a purpose for these as there doesn't appear to be evidence of any others on this stretch of canal - I would be interested to hear from anyone with more information. Above-left we are in the same spot but looking towards the City: remember that the whole of the right bank formed the facilities at Cadbury Wharf: as an indication of the sheer scale of the area, if you enter the canal at Bournville station - the other side of Bournville Lane road bridge from the wharf - a sign indicates it is 1km to Raddlebarn Road bridge. 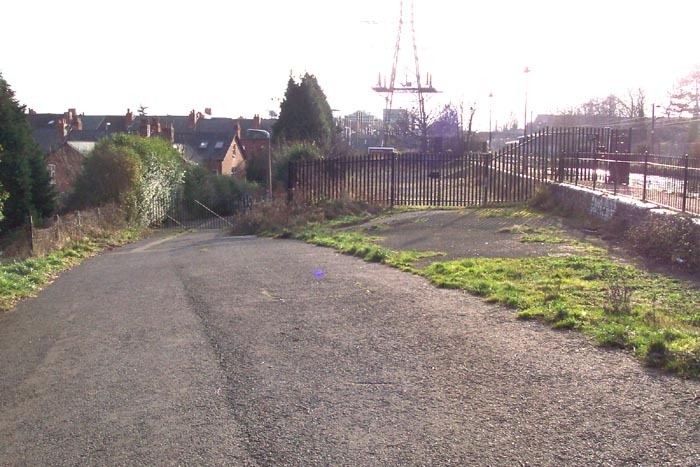 As you have seen, Raddlebarn Road is only just beyond the bridge carrying the Cadbury Railway from works to wharf. 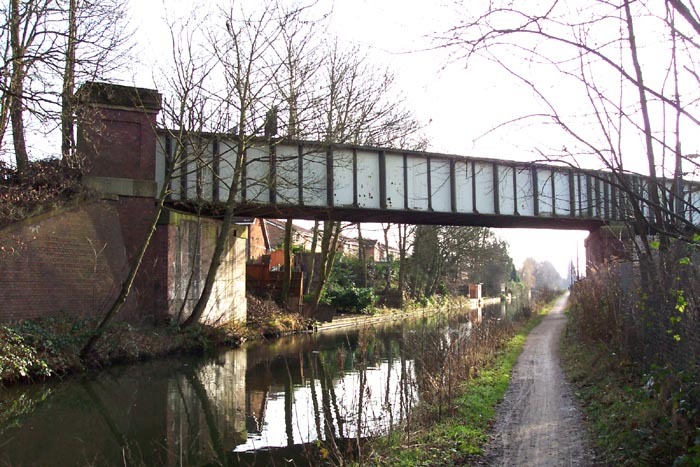 Back on a firm railway footing, this was my most enjoyable part of my study as I have seen many photographs of the bridge spanning the railway and canal but none from bridge level itself showing where it goes. The residential development now occupying the site comes very close to the bridge's end - I did wonder whether or not the bridge actually arrived in someone's back garden such is its close proximity to the site! 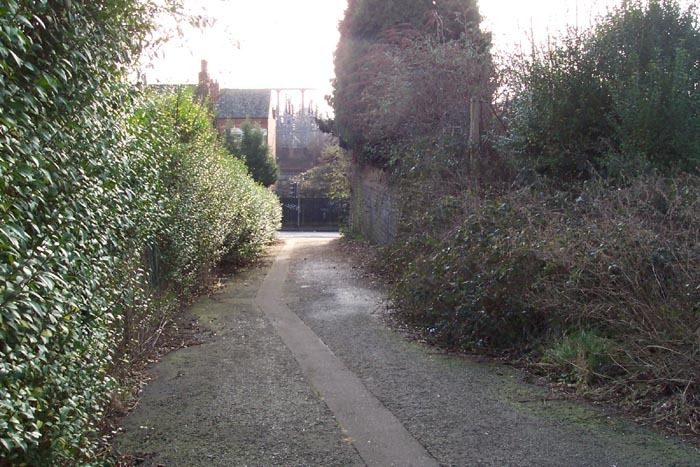 However, between two bungalows on Raddlebarn Farm Drive is a short driveway to a very small car park to the rear of the properties: above is the view you get when you enter this car park. The bridge end is quite impressive but unfortunately, heavily overgrown, has had a reasonable amount of rubble (now too overgrown) dumped at its mouth and has large iron gates firmly locked. 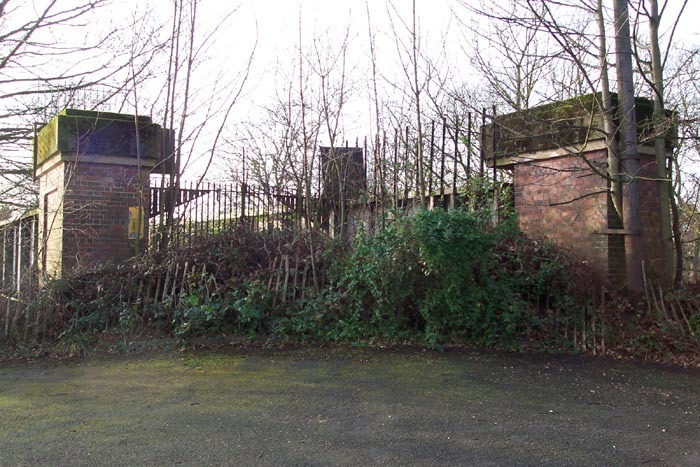 Above-left we see the aforementioned gates and the thicket of brambles now serving to further protect the entrance to the bridge. I am no stranger in my exploration of bygone railway sites to fighting my way through stinging vegetation but even I drew the line here at attempting a better 'across bridge' shot. Above-right we have moved a couple of yards to the left of the previous photograph to get a perspective of the bridge in relation to the canal and Midland line looking across to the works. 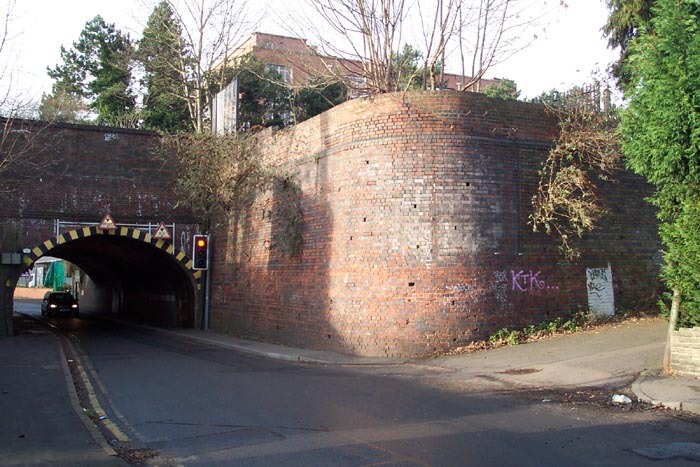 The railway itself spurred into two after coming off the bridge with one branch traveling to our left-rear to serve the wharf and another right-rear to a buffer stop and siding fronting Raddlebarn Road which formed the other, and more convenient for large road traffic, road entrance to the site. This is truly a fascinating site on a grand scale but the lack of remains is somewhat disappointing. The Cadbury Railway's 1976 demise from the days when three quarters of the factory's output was sent by rail was due, as with many other industrial lines, to cheaper road transport and the simple fact that railways didn't go to all your outlets (and your suppliers too were converting from rail to road) and road haulage was still required to get goods from your trains to your outlets.